John Waldo Nash was an expert Norway taxidermist, famed as the originator of a unique way to stuff and permanently preserve fish for display. In the early 1890’s, Nash operated a two-floor workshop, located on Temple St. where the Norway Masonic Temple now stands. He employed four assistants and at least eight agents all over Maine. 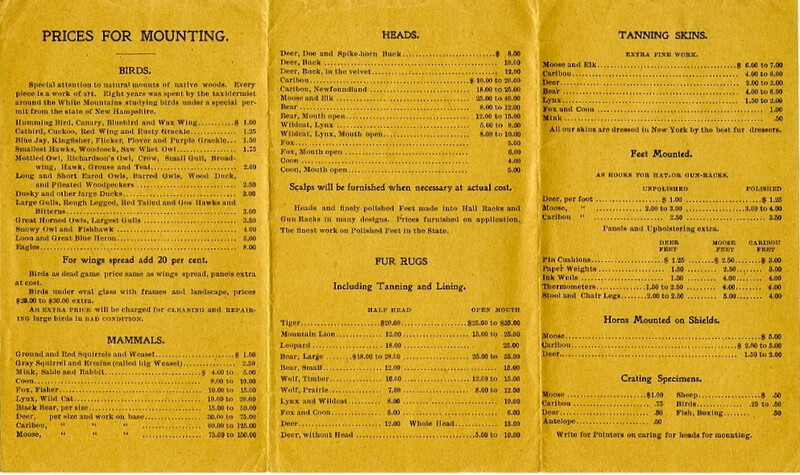 He was also the official taxidermist for the Grand Trunk Railway system, helping promote train travel for sportsmen. 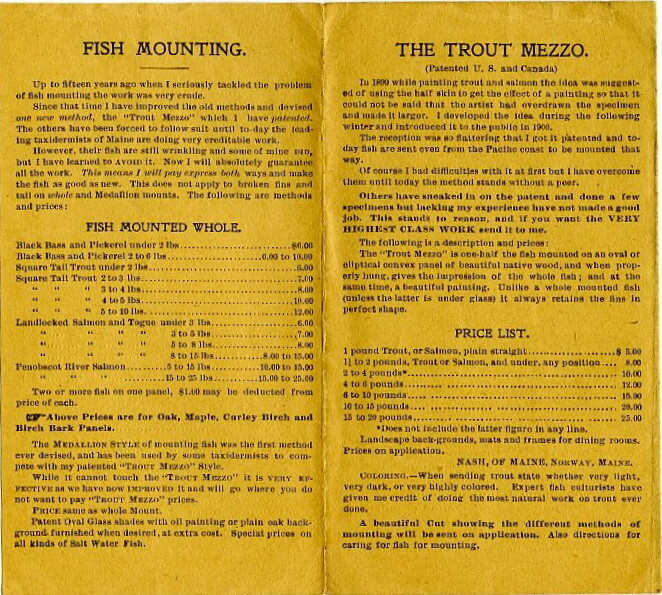 Nash invented and patented “Trout Mezzo” a way to stuff and mount fish. 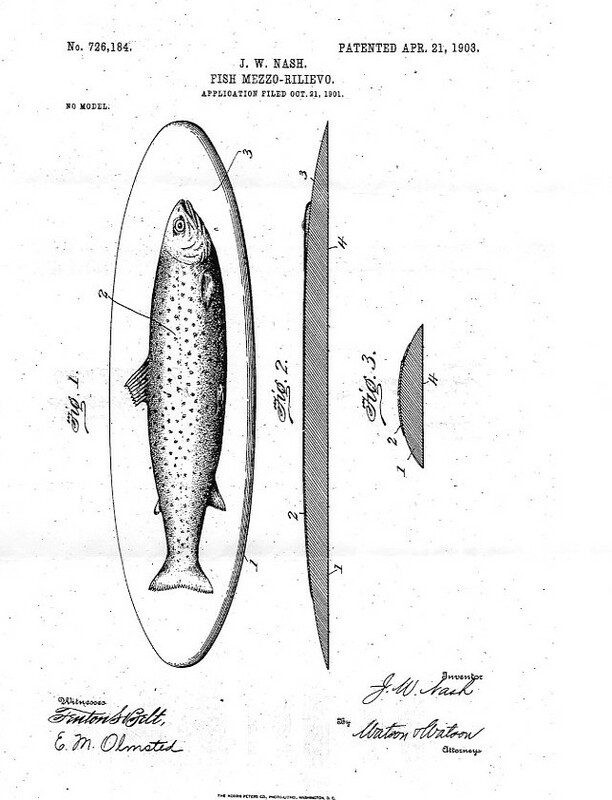 One half of the fish is mounted on a convex wooden panel, so that a whole fish appears to be in relief. He displayed his work at world’s fairs such as the Paris Exposition in 1900 and the 1915 Panama-Pacific Exposition in San Francisco. He won many gold medals all over North America and abroad. Nash’s wife Alice worked side by side with her husband as his assistant. Her specialty as a taxidermist was preserving birds; however, she also painted the background that appears on some fish panels. As seen by a Journal reporter: — Over behind the counter between two windows may be found “Nash of Maine,” Waldo to his neighbors, J. Waldo by christening, but just “Nash of Maine” from Maine to California ever since his work as taxidermist has gained national and international reputation as truly represent­ative of the Pine Tree State and of his art. Then he told how, in recent years he had been able to turn over the bird mounting wholly to Mrs. Nash, who has gained an enviable reputation in this line, so that he, himself, had been able to spend all his labor on the fish mounting and kindred work. In his hands was the skin of a square tailed trout from our Maine lakes, a beauty to make “green with envy” any lover of the rod and reel. His task at the moment was to fit this carefully to the model prepared for it. “Over there,” said he,” is our pickling tank,” and he pointed to a big case in one corner of the room where in several compartments were scores of fish skins being preserved in brine. From this tank he had just taken this specimen for mounting. “Do you make your own models?” was asked, as the array upon the shelf was being glanced over, each shaped carefully into the resemblance of a fish & the wood painted white. It is the special white painted wooden model, fashioned for it that each fish skin is attached. First the tail is fitted and then the skin drawn as tightly over the “body” and smoothed down until not a wrinkle is left. The least air bubble is pricked and the skin is drawn as tightly as it ever fitted its own flesh before the model is reversed and the edges on the underside are tacked down. Now and then a bit of putty is added to the model to make the skin a perfect fit. Then the head is put in place, the “eye” socket is gouged out of the wood and final fitting is finished. The decorating of the skin by touching up the color tints is no small fea­ture of the work, after which comes the final application of varnishes, the secret of which is not divulged. Thus in the finished product, one has a work of art on a nature-basis the peculiar delight of which is that the owner thus gains permanent possession of the actual trophy of his skill. For the fish-skins thus mounted & set in relief upon plaques form highly decorative wall-pieces for the dining room or den. No small amount of skill is needed for the various details of the work, and also an exact knowledge of the various types of fish which find their way here to the shop for mounting. In this state there are the six distinct types and Mr. Nash frequently receives fish from other states and from Canada with the character of which he has to acquaint himself. For instances here on this occasion were to be found two tarpon from Florida and a rainbow trout from Michigan. Asked about his birds, for it is generally known that Mr. Nash has one of the finest private collections in the state, he said that all these were packed away and not easily accessible. The whole collection includes some 300 specimens. This work was largely the result of eight years’ study of birds in the White Mountain region under a special permit obtained from the government. His con­tribution to the list for Maine was 168 accepted specimens, besides 22 others which were in doubt at the time & were left out but which since have been seen by experts and accredited. 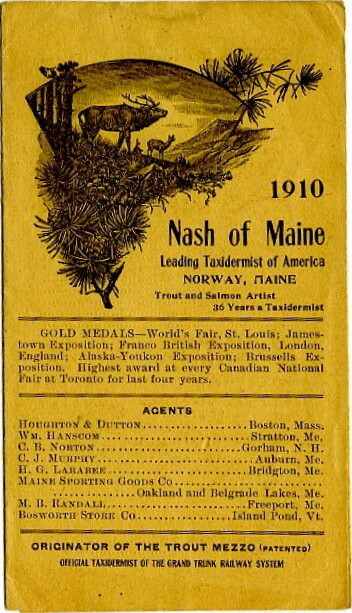 In this connection, Mr. Nash expressed his regret that the Boardman col­lection was ever permitted to leave Maine. This included Boardman’s accepted list of 248 birds for Washington County which was his valuable donation to the Maine birds, the collection having been bought by New Brunswick authorities a few years ago. Among the rare birds in Mr. Nash’s list was the black buzzard or vulture from the south, the specimen found by Mr. Nash being now in the collection of George R. Howe, the Norway naturalist.